In attending Chicago’s recent Cusp Conference, I came across a host of innovative guest speakers who are changing business models through better design. One of them I thoroughly enjoyed hearing was Dr. Joyce Lee, who is an Associate Professor of Pediatrics at the University of Michigan Medical School and an Associate Professor in the Department of Environmental Sciences at the University of Michigan School of Public Health. Dr. Lee’s design inspiration evolved from a very personal issue: Both of her children have allergies, one of them at a very severe, life-threatening level. If her 6-year-old were exposed to certain foods, he might go into shock and have difficulty breathing. Think about if this was your child and you had to instruct their daycare teacher how to save your child’s life without you being there. A terrifying thought for any parent, really – especially since the Allergy Action Plan chart that Dr. Lee could’ve potentially provided was a maze of confusion. It’s no wonder that between 1994 and 2007, there were over 15,000 unintentional injections in the U.S. with EpiPens. Even trained nurses, paramedics and physicians were inadvertently self-injecting. 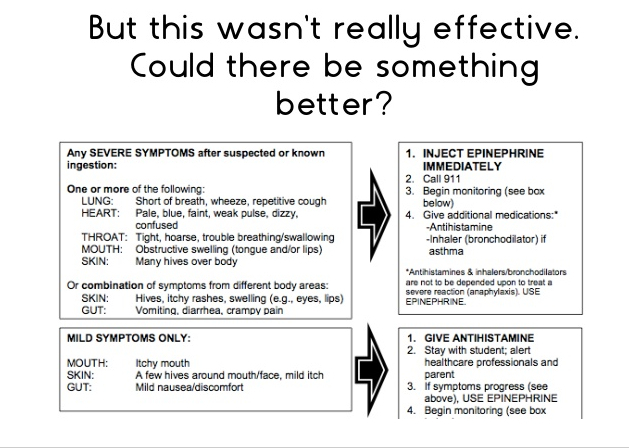 Knowing that the above option wasn’t realistic nor could she expect to teach her 6-year-old to administer an EpiPen (medical device used to inject epinephrine in the event of a severe allergic reaction) to himself to save his own life, Dr. Lee knew there had to be a better way out of necessity that was more user-friendly. During her sabbatical, Dr. Lee studied data visualization and figured out how to think like a designer. She started to blog about design and its intersection with health care. She wondered how the very model of health care could get a redesign. And that’s when something simple became better design. Dr. Lee scripted a YouTube video – but the real star was her child, who illustrated and narrated the video. Come on. Who can possibly ignore a cute 6-year-old’s drawing as he or she explains it? Very few people. Which is exactly the point. Dr. Lee posted it on her blog and sent the link to her child’s teacher. The teacher thought the idea was brilliant and shared it with hundreds of other people within days. Those people sent it to more people (undoubtedly some of them parents of severely allergic children in a similar predicament). Before long, Dr. Lee’s little instructional video starring her son had gone viral. A follow-up video was also made in this format, such as one relating to handling sensitive food ingredients. Think about this for a moment. A video series by a 6-year-old is better design than a complex chart of circumstances and actions that was probably created by a council of physicians. Suddenly the phrase, “Explain it to me like I’m a 6-year-old” has even more relevance than we thought. The lesson here for brand marketers is that there are countless times when we can outthink ourselves out of good design. We don’t think like the person who actually has to use our product or service as much as we should. We don’t think about the way they make decisions. We go by what we think sounds best instead of envisioning their lives and the way they absorb information. Which is why we get lousy ads full of specifications and marketing jargon instead of simplicity and English. Instead of just getting to that next logical step in the thought process, we spew every possible piece of information at them in a first impression, overwhelm them and turn them off because they don’t have an eternity to spend with us. Taking a look at the example of Dr. Lee’s son, how well do you think that approach would’ve worked out? So take a fresh look at the processes and language you’re creating around your brand with this in mind. Is that good design? Or bad design?